Make your food preparation tasks easier and faster with the 300-watts power base of the NuWave Technologies Twister. The stylish and compact design of this NuWave Technologies 7-piece blender compliments the looks of your modern kitchen. Finely chop or grate vegetables, fruits, nuts, etc with the tall chopper container of this Nuwave Technologies blender. 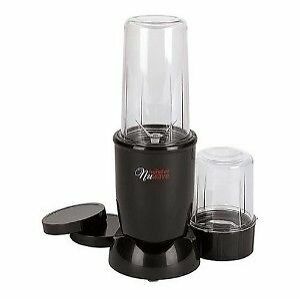 Blend perfect smoothies, soups, cocktails, etc. with the blending blade attachment of this NuWave Technologies 7-piece blender. The leak-proof lid of this Nuwave Technologies blender prevents juices and other blends from spilling out. Dishwasher safe, the NuWave Technologies Twister can be easily cleaned. For a recently single man, this is a very good product. It not only functions as a blender but a food chopper/processor as well. It makes great smooties with minimum fuss and clean-up. Also great for chopping nuts, herbs, vegetables, etc. The only potential drawback is its size. Plan on making individual smoothies or drinks. But for a single person or even a family of two, it is great! Very nice replacement for my not so good Magic Bullet. The best thing is the cups, replacement rings etc. from the Bullet will work with this blender. Top rack dishwasher safe to boot Don't know how long it will last, but thus far I love it. Quick, simple and it does the job right. I use it mostly for nutritional shakes and grinding Chia seeds. The only problem I had, was my own fault. I accidentally put my drink powder in first and it didn't quite get it blended--there was some mix left at the top. As with any personal blender, the easy fix for that is to put the liquid in first. It is noisy, but for the few seconds I have it on, even the still in bed, grumpy hubby doesn't complain! This is my second blender. I liked it so much that even though my first one broke, I got another. It has the most aggressive blades for chopping ice for my shakes. Sure there is the nutra ninja but other than that, there is not another small blender I can find with this much power and blades that are upright. I have test a few and taken them back. Powerful and very effective...worth every penny. I needed a spare mini blender for my vacation destination...can't take the blade part thru airline security. This particular brand was amazing. It has a lot of horsepower for something so small. Went thru ice cubes and frozen fruit with no effort. Tornado effect was instant and no wait time for liquid to come to the bottom to mix it all up. If I even need another one, I would definitely get this one!